There is a private residence on Franklin Park's west side in Bloomington, two blocks south of Illinois Wesleyan University. Of large red stones, it is well-kept up and has a modern addition on the back side. Like all the buildings on Franklin Park, including private sorority and fraternity houses for IWU, it is under the watchful eye of the Franklin Park Historical Society; the area is a Historic District. Franklin Park also hosts a house designed by Moritz and, in immediate proximity, a brown brick Georgian 3-story belonging to SAI music sorority, a privately owned Tudor cottage, and a castle-like red brick Victorian with circular tower to Alpha Lambda Chapter of Phi Mu Alpha Sinfonia Music Fraternity. Hi! I was looking at your page and I had noticed a picture that was VERY familiar to me. This is regarding the houses in question in Franklin Park, Bloomington, Il. ( the Unknown castle ) I was a member of SAI the female music sorority, and figured I would forward you all the information I have on our house. Hope this helps! January 13, 1941 marks the date of the purchase of the SAI house at 307 E. Chestnut Street, Bloomington, IL. Without Miss Bessie Louise Smith, an SAI sister and music faculty member at IWU, this venture would have been impossible, for she underwrote the loan for $10,200 to purchase the house. In 1972, a Mrs. Groves of Clarendon Hills, IL, stopped by the SAI house and related that her grandfather built the house. His name was Aldrich and he was a banker in McLean, IL. Mrs. Groves remembers visiting her grandparents here and she said she was afraid of the basement. The house was completly finished; plastering, flooring and all even on the third floor but that the floor was never used then. The original kitchen was the southwest corner of the first floor and the housekeepers room above that. Her grandmother and the housekeeper spent a lot of their time on the landing doing mending and handwork. Later, Mrs. Groves' own parents lived there. Her father was a doctor, Dr. Tenbrook, and his offices were where the extra closet and bath are and his patients came in the side door. Never at any time did more than two elderly people occupy this house until it was sold to the Sigma Alpha chapter of SAI. It was some years later that a room and bath were added to make a suite for the housemother on the first floor, the only structural change made except for the addition of a required fire escape. To this date the house has served us well. Correction: In 1900, Bloomington experienced a major fire, and the home of Adolph Adler I burned. He and his family moved into their hotel, the Illinois House (a Second Empire monstrosity that still stands defiantly ugly, albeit softened with age) until they could buy another. They bought the "castle" in Franklin Park circa 1901. There is a stone with the date 1889 engraved, but I wouldn't call it a cornerstone. I don't know who built the house - sorry. I made a stupid assumption. Mother points out that the Fire of 1900 burned the City Hall, but left the County Courthouse standing - as a result most property records of Bloomington before 1900 were lost, and there are still suits at law before the courts over property lines in Bloomington because of those lost records. The old Adler House stood where the parking garage for the Old State Farm Building now stands. Mother also looked at your site and believes the "castle" mentioned as a frat house is actually the Brock House at the corner of McLean and Walnut streets. It is across the street from the Stevenson House, and both are on the north-east corner of Franklin Park. I used to date Mary Brock and earlier played with her as a child in Franklin Park - we are of an age, and she gave a kitten, Birthmark, when we were in Fourth Grade at Franklin School. I can supply a recent photo of Brock House, but it is actually a clapboarded Queen Anne with a round tower and pretensions to the Shingle Style and High Eclecticism. I believe it became a rooming house for a few years. I wouldn't think it meets your qualifications as a "castle." The Tudor house mentioned is the Potts House, and the cottage is the Sweeney House where my best friend, Robby, lived until he was killed while riding his bicycle by a drunken driver from Chanute AFB at age thirteen in 1969. He was buried from the funeral home that stood at the north east corner of the park, just a few hundred feet from his home, in a Victorian-era French Revival mansion (Flinchpagh's?). The mansion is still there and again a private home (now that would give me the heebie-jeebies). While I was doing some research on a local historic property I found your website. I wanted to send along some additional info about the 'Unknown Castle' listing in Bloomington , Illinois. It is located at 908 N. Prairie St. on the west side street of Franklin Park. Both people who wrote you about it gave you incorrect info about the wrong castle house, although there is one property at the NW corner of the park which could resemble a castle , but nothing like the photo you post. It was designed by architect George Miller about 1908 , in the Richardsonian Romanesque style. Its original owner, Marion Lee McClure was a farmer and landowner. 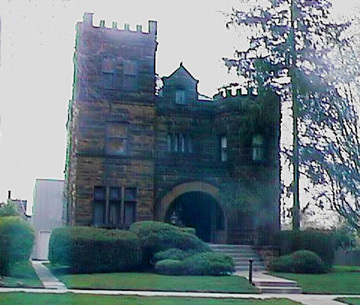 The"Castle" as the home is unknown, has remained in the McClure family. I found this information in my copy of Bloomington- Normal Lost, by the Old House Society, copyright 1982. Oddly enough I went to school with a Lauren McClure who used to live there, and we have remained friends to this day. She is a descendent of the original owner. Thanks to Chris Nelson for sending the photo, and to Lori Kessenich for sending the information.